"Most Thorough Dryer Vent Cleaning Santa Barbara!" Every year, more than 24,000 dryer fires cause in excess of $50 million in property damage in the U.S. alone. Many of these fires result in injury and death. Lint is combustible, and when dryers can't expel hot air – inefficiency, dryer damage, and fire are the result. Most dryer damage and fires could be prevented with proper dryer vent maintenance. Dryer lint is highly flammable and has the potential to ignite at any time. Even a cleaned lint screen traps only 75% of the lint produced inside a dryer. The rest of the lint builds up over time inside the dryer vent, becoming a dangerous fire hazard. Your Clogged Dryer Vent is Costing You $18 to $24 Dollars Extra Each and Every Month! When dryers take longer than one cycle to dry clothes, the amount of wasted energy can be substantial. This results in using two times, three times, or four times more energy than is needed to dry clothes. Healthy Home Plus technicians can identify any problems which may be present in dryer ventilation systems. Most houses, condominiums, and apartments have never had their vents cleaned and by having them thoroughly cleaned regularly, most dryer problems could be prevented. One of the most important functions of a dryer is the elimination of moisture recovered during the heating of damp clothing. This moisture is held in the warm air produced by the dryer as humidity, and is normally expelled to the outdoors through the dryer's vent. If this air can not be adequately removed, poor drying will result. This moisture can also condense into pools of water in the dryer vent, eventually leaking out. Any moisture accumulation inside the dryer ducting is a sign of poor venting which should be corrected immediately. The heat is another important function of a dryer. Many current dryer models have a 'one-time', non-resettable, thermal fuse or safety. These safety devices will open should the dryer's vent not be installed properly, or if it becomes restricted. Once this happens, the dryer will no longer heat and will require the part to be replaced to correct the condition. On older models without one of these thermal safeties, poor venting can cause the dryer to cycle on its safety thermostat, instead of the temperature control thermostat. This usually contributes to poor drying and can cause overheating. On some models, the malfunctioning of the timer operation affects some cycles. The U.S. Consumer Product Safety Commission estimates that in 1998, clothes dryers were associated with 15,600 fires, which resulted in 20 deaths and 370 injuries. Why Have The Dryer Vent Cleaned? 1. Extend the useful life of your valuable appliance. 2. 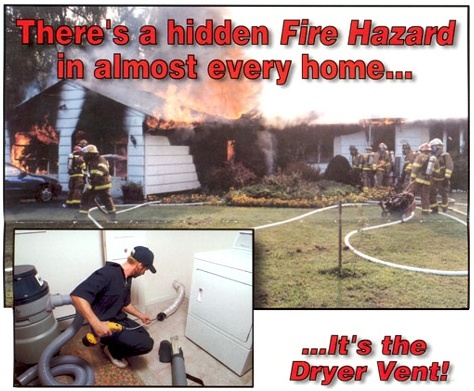 Reduce the chance of a dryer vent fire. 3. Reduces "wasted electricity" and "appliance stress". 4. Dryer Vent Cleaning will improve the air quality in your home. How Long Will You Go Without A Thorough Dryer Vent Cleaning? Request an Online Instant Dryer Vent Cleaning Quote Right Now!